Copper Compression Hip and Thigh Support Braces provide you the ultimate in support. 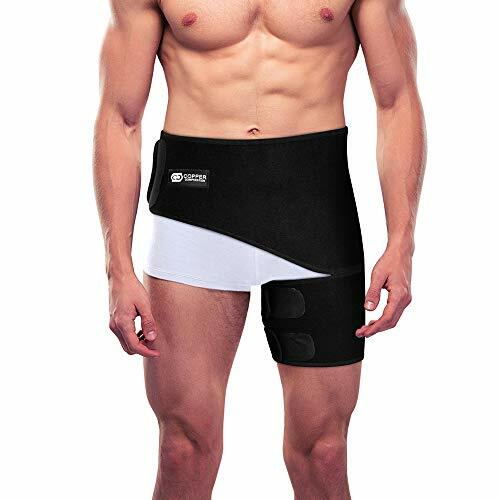 This brace supports stiff and sore muscles while allowing you to retain full range of motion! We Stand By All of Our Products With An Unbeatable 100% Money-Back Guarantee. GET THE RECOVERY YOU DESERVE with our ultra comfortable fabric that gives you thigh, hip, and lower back healing compression support while still ALLOWING YOU TO RETAIN YOUR RANGE OF MOTION. This is extremely therapeutic because by retaining your range of motion and circulation, your muscles can continue to work and strengthen. FULLY ADJUSTABLE FOR ULTIMATE COMFORT - Copper Compression hip and thigh supports are for both men and women and are extremely breathable and comfortable. These braces are fully adjustable and can be worn everyday to help you get the support you need! Perfect for any Tommie, Jane, or Harry. Our high quality fabric will also withstand washing and will not lose its function over the course of time like many other products! Designed to fit thighs up to 28" and waists up to 48". If you have any questions about this product by CC Copper Compression, contact us by completing and submitting the form below. If you are looking for a specif part number, please include it with your message.